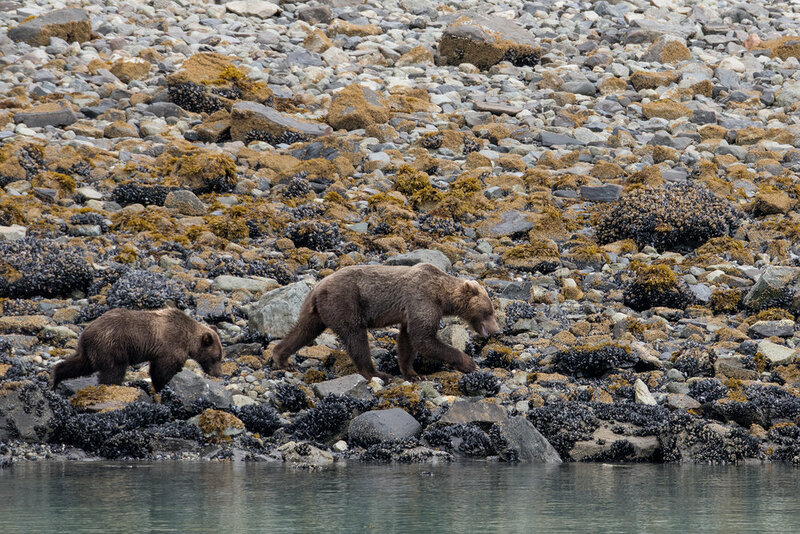 Of all the wildlife we hoped to see in Alaska, we knew bears would be the most fleeting. While hiking or kayaking in bear country, you have to take steps to actively avoid them! But on board Our UnCruise in Southeast Alaska, we hoped we could spot some and enjoy their antics from a safe distance. 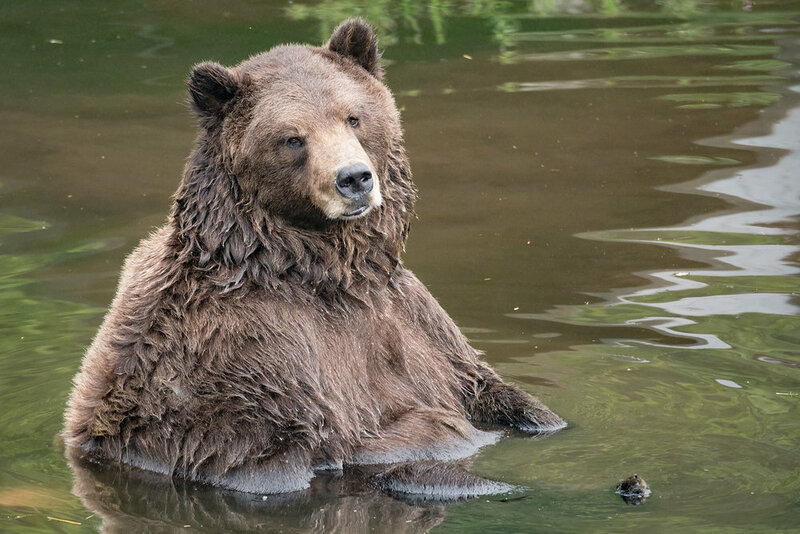 Luckily, for us, we had several wild sightings of bear during our late August visit, including some amazing behaviors such as a family of brown nears hunting under beach rocks and a black bear swimming! As an insurance policy to see bears, we decided to visit Fortress of the Bear in Sitka, our port of embarkation. 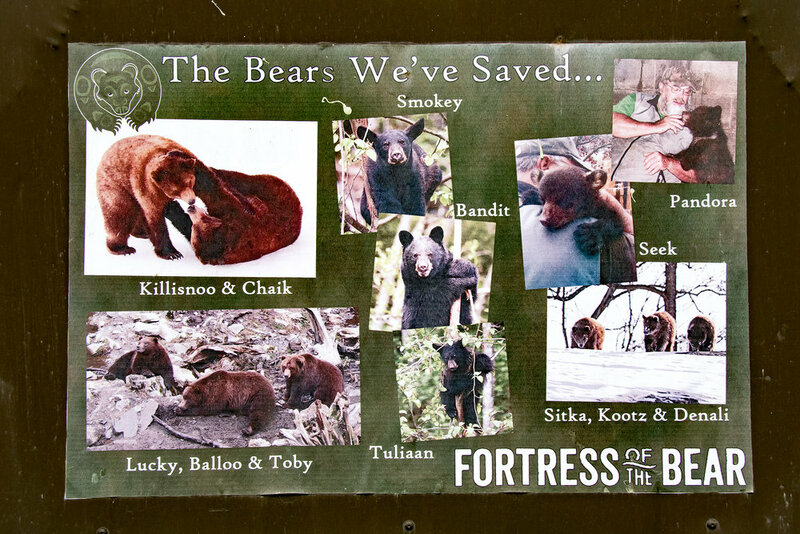 Fortress of the Bear was started as a non profit preserve for bear cubs that would otherwise be euthanized when their mother was killed or needed to be euthanized by AK fish and wildlife officials. Before FOTB, there was no rescue organization, and cubs were put down with their mothers or euthanized if their mothers were killed accidentally. Fortress of the Bear re purposed a huge wood processing area, using the pulp silos as habitats for the orphaned bear cubs they accepted. Old pulp wood silos serve as habit for bears, and the platforms above allow visitors to safely view the bears up close. There, staff would train bears in behaviors to help veterinarians examine them (such as lifting a paw on command or opening their mouths for inspection) This allows FOTB staff and vets to monitor the health of animals from afar without needing to drug them unless absolutely necessary. 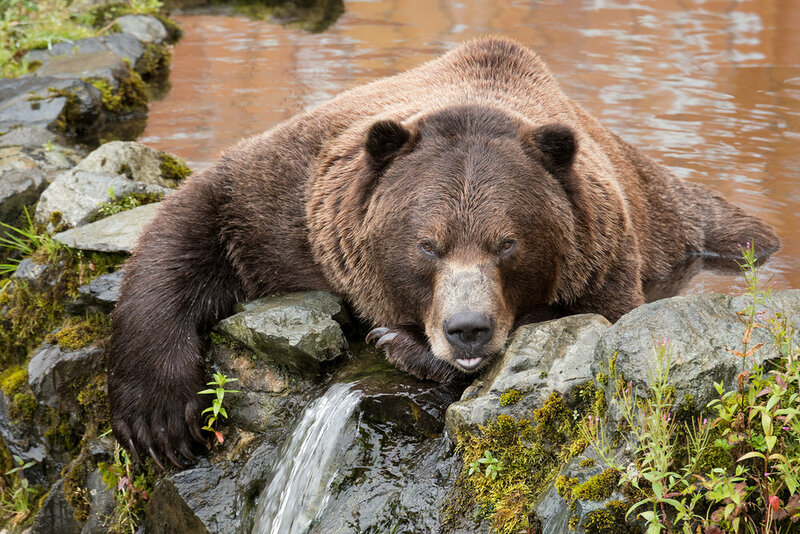 As animals that can never be released in the wild (they are fed by humans) FOTB can provide animals to certified zoos and also raise money for their mission by inviting visitors to see the bears up close. Smokey climbs a tree to get a better look down on the coastal brown bears in another enclosure. Another enclosure is reserved for brothers Chaik and Killisnoo, who put on quite a show, playing and swimming while we visited. Fortunately, we did get to see bears in the wild in Glacier Bay National Park, which was easily one of the highlights of our time there. 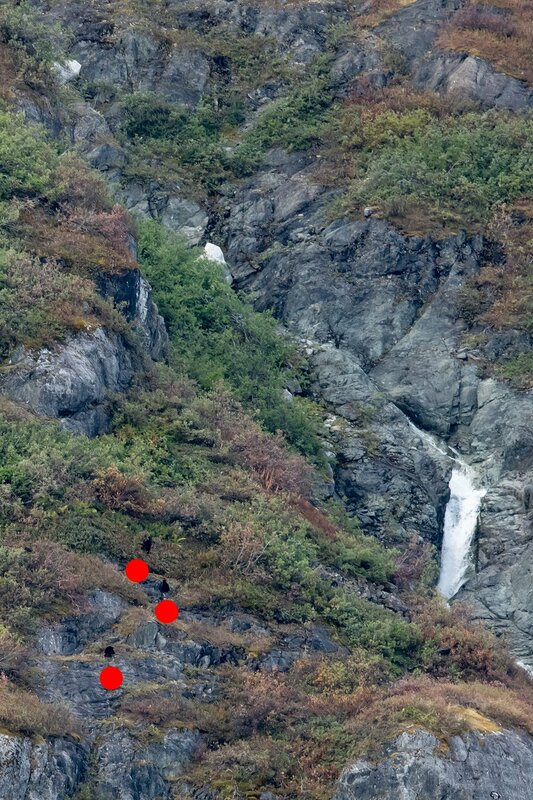 Our first sighting was a very distance view of black bear on a hill just past the glaciers in Glacier Bay National Park. I spotted them through my binoculars, a mother and 3 cubs! I shared our findings with the guides on deck and the captain slowed our ship and we moved closer to the shore where they were located. But because of how high they were in the mountain, and that they were moving in and out of the shrubs, they were difficult to see without binoculars and difficult to photograph. Later we would see an unusual sight, a black bear swimming in the water heading towards the Glacier Bay National Park visitors center as we docked nearby! But the biggest treat was when our guides spotted 3 bears, a mother and 2 large yearling cubs, walking along the shore of Russel Island. We were able to drift close enough to see them pretty well with the naked eye. Everyone on board was silent, as to not disturb them from their work. They were making their way along the shore flipping huge rocks along the shore with complete ease with their huge paws. From the bow of the ship we could hear the rocks clacking against each other and the sound of black legged kittiwakes making alarmed calls as the bears got close to their nesting area. The bears were hunting for tasty seafood, including sea cucumbers and sea stars we had seen on our shore walks. We watched for over an hour as the shaggy brown bears padded on their huge paws, from one rock to the next, with the cubs hustling along every so often to catch up to their mother. After an incredible hour in silence enjoying these huge animals in their natural environment, we were all excitedly comparing photos and the wonder of having this incredible wildlife sighting with our fellow passengers. 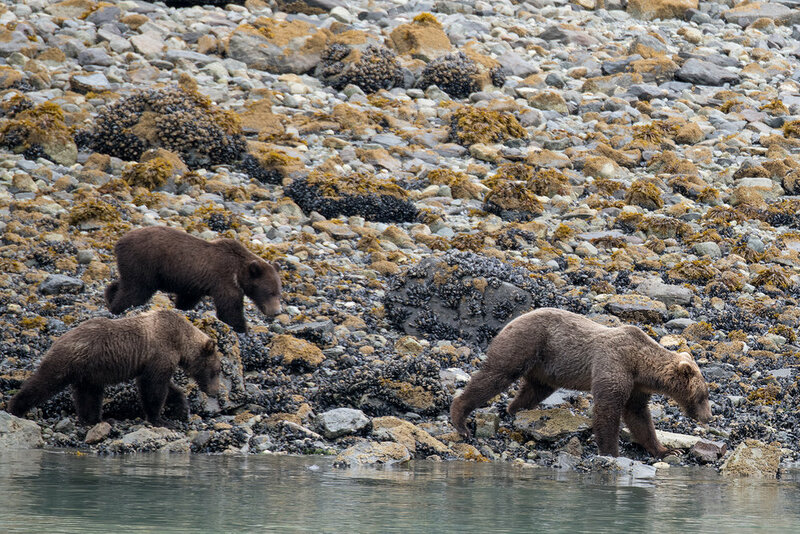 We moved on to see more wildlife in GBNP...for more photos and more of our experience on Glacier Bay National Park please see our post Here. Check out the size of the rocks these huge bears flip easily in the video below!